Concrete Barriers, originally referred to as a “Jersey Barrier”, were introduced in the 1950’s to divide multi-lane highways. Now concrete barriers are used to reroute traffic and protect pedestrians and workers during highway construction. It is also used to protect open trenches during underground utility repairs and replacement. The original design was intended to reduce damage from accidents and lower the likelihood of a car crossing into oncoming lanes. Concrete Barriers are also used to block entrances of governmental, security and military establishments. You will also find concrete barriers lining race tracks. 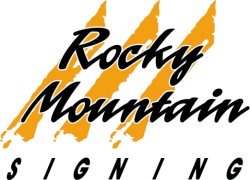 The concrete barrier sections supplied by Rocky Mountain Signing Company is 10’ long, 42” tall, weighs 4000 lbs. and has been designed to allow water drainage. Contact us today for more information about buying or renting Concrete Barriers!